Written by Alan J. Schoolcraft andÂ Brent Simons. Starring Will Ferrell, Brad Pitt, Tina Fey, Jonah Hill, and David Cross. 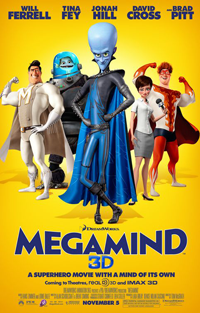 When it’s great, it’s great, butÂ Megamind is regrettably peppered with a few too many of mind-numbingly stupid gags to just get passed them like the two “undies” jokes in Dragon, and it incongrously tacks a groan-inducing song and dance number set to Michael Jackson’s “Bad” to the end of the film, apparently because it wants to leave the audience with a bad taste in their mouth. The taste of vomit. That kind of stuff, and a few too many more nitpicks like it, drag downÂ an otherwise fun and oftenÂ very funny super-hero action movie from being a truly terrific flick to just being an above-average Dreamworks cartoonâ€¦ with some extremely cool stuff in it, (Mega-)mind you. This film is blatantly just the Superman mythology with a barely enough tweaks to prevent a lawsuit: Metro Man is a conceited, dim Superman; Roxanne Ritchi is Lois Lane almost note for note; Hal Stewart is a creepy riff on Jimmy Olsen, red hair and all; and Megamind could very easily have been Lex Luthor in one of his evil scientist incarnations. Hell, he’s even bald.Â For all the criticism (or praise) that The Incredibles gets for being a riff on the Fantastic Four, at least they changed up the formula, and Syndrome wasn’t a thinly-disguised Doctor Doom. But maybe criticizing a Dreamworks movie for not being original is a waste of time. My other big quibble requires a bit of a spoiler warning. (Mind you, the film’s trailer spoils it for you, too.) The premise of the film is this: evil genius Megamind (Ferrell) accidentally kills his arch-nemesis Metro Man (Pitt), leaving him kind of bored and aimless in life after taking over Metro City, so he gives Hal Stewart (Hill) superpowers in order to turn him into a new hero. But, because Hal Stewart is creepy and ugly, of course he’s not hero material. Tighten (yes, not “Titan” â€” Tighten) quickly turns bad, and without a hero to fight off this new supervillain, Megamind steps up and becomes the good guy. Which is all well and good, but everybody â€” Roxanne (Fey) and all of Metro City â€” is so quick to forgive Megamind’s past and hail him as a hero that it strains credulity way too much. I mean, if you can believe that he never once seriously injured a single innocent person, despite years of terrorizing the city, not even accidentallyâ€¦ except for Metro Man, whom everybody seems to mostly forget aboutâ€¦ then maybe that’s believable, but come on. (End spoilers.) For me, at least, that flies past straining credulity and well into contrived territory. At super-speed. But, seriously, the super-hero action is pretty awesome stuff. If that’s not enough for you, give it a pass.Â If it is, though, as it is with me, then you’ll have a lot of funâ€¦ in addition to rolling your eyes at the Dreamworksiness of it all. This entry was posted on Tuesday, November 9th, 2010 at 19:44pm	and is filed under Movie Reviews. Wait. I thought Kung-Fu Panda was Dreamworks first truly great film? Have I said that about Kung Fu Panda? It’s really good, the action is awesome (as it is in Megamind), and I own it on DVD, but it’s not something I’m going to watch over and over like How to Train Your Dragon or half of Pixar’s movies. I’d say it’s their second best movie, after Dragon, but that it falls just shy of the “truly great” mark. I remember you were pretty enthused about Panda when it first came out. You weren’t obsessed about it like you were for How To Train Your Dragon, but you argued on it’s behalf in a few episodes of The Triple Feature. Maybe I’ve been inconsistent with my use of the word “great.” What I mean by “truly great” here is “masterpiece,” as opposed to just an awesome, fun movie (with some shortcomings) â€” that is, the difference between a five star movie (Dragon) and a solid four-star movie (Panda). Megamind, incidentally, is more of a three and a half star movie, but I don’t do half stars. But the actiony bits are pretty freakin’ awesome. I enjoyed Megamind more than HTTYDâ€“ with the exception of the big bad in that movie, all the dragons were a little too cutesy for me to believe the initial premise of them as a threatâ€“ but I stole (er, borrowed) your adjective “Dreamworks-y” to describe the ending before I’d even read this review. Liked it a lot, though; I enjoyed the humor and the action both. The three-d was well placed (and I wore my contacts this time, so I didn’t have that glasses-on-glasses pinchy-ear headache, which helped). Some of the fight scenes were, as you say, absolutely beautiful. There really isn’t an excuse for the next Superman movie not to look at least as good as this did. That’s what I gave it, too. My biggest complaint was that life went a little too much back to normal in the middle part of the film. Sure, Megamind was dealing with personal stuff so he wasn’t terrorizing the city, but then Roxanne or any other citizen should have commented on how weird that was. That being said, David Cross is the most adorable alien fish in a robot ape suit I have ever seen!